Jacob Viner (1892-1970) first examined the specific factors model, which is a variant of the Ricardian model. It was further developed by Paul Samuelson and Ronald Jones. It is also called the Ricardo-Viner model. Michael Mussa (1974) developed the graphical approach to illustrate the main results of this model. In contrast to the Ricardian model, this model includes two specific factors. Viner designed the model to explain the migration of workers from the rural to urban areas after the Industrial Revolution in the 1820s. Specific or fixed factors suffer the vicissitudes of urban life much more than the mobile factor, labor. There are two types of factors. Labor is the mobile factor that can move between the two sectors. Each of the other two factors is assumed to be specific to a particular industry. That is, the quantity of a specific factor is fixed. Specific factors cannot move between industries. The economy produces two goods using three factors of production, capital, land and labor in a perfectly competitive market. Labor is the mobile factor, and there are two specific factors, K and T.
Land is a specific factor in Finland. 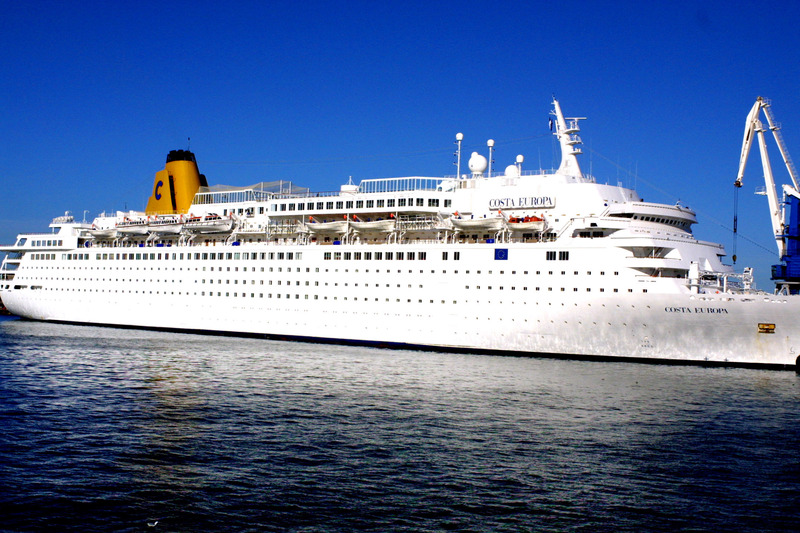 Finland produces ocean cruisers and leather products such as reindeer fur, mink and fox coats. Lapland, the nothern part of Finland, is sparsely inhabited by Indians who hunt these wild animals. The cold climate is a factor specific to the leather goods industry. In the urban areas Finns are also engaged in shipbuilding and Finland exports cruisers to the European countries. In addition to well educated workers, the shipbuilding industry requires a large amount of capital, which is specific to that industry in that it cannot be used in the leather goods industry. Finnish workers are mobile between the two industries. Palio in Piazza del Campo (Siena, Italy 2000). Horse trainers are specific to the horse industry. Jockeys ride horses without saddles. Specific Factors model vs Heckscher-Ohlin In a Heckscher-Ohlin model, both factors, capital and labor, are assumed to be mobile. Recall that in production decisions, some factors are fixed (and hence specific) in the short run, but all factors are variable inputs in the long run. Hence, the HO model is a long-run model, whereas the specific factors model is a short run model in which capital and land inputs are fixed but labor is a variable input in production. As in the Ricardian model, labor is the mobile factor between the two industries. 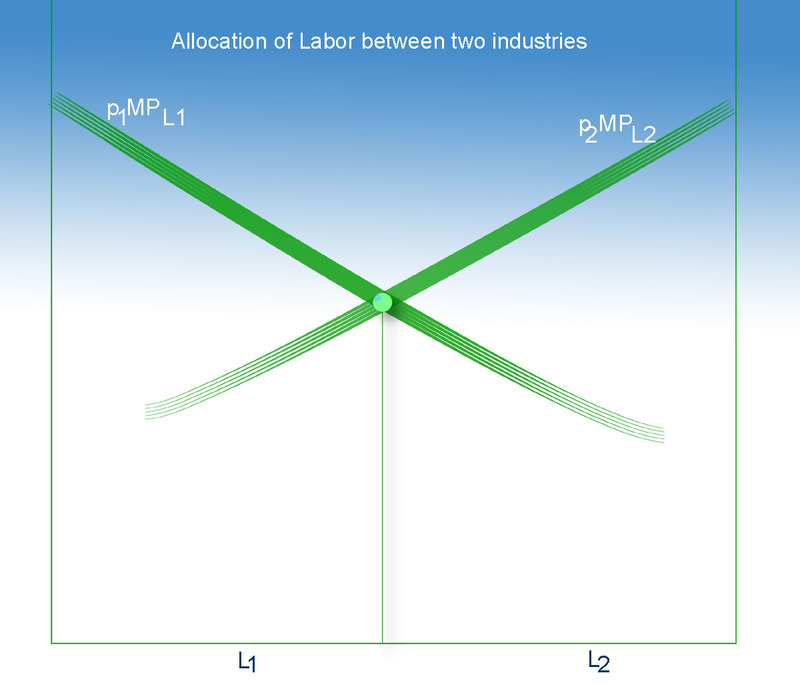 Optimal allocation of labor between two industries: Value of marginal product of labor must be equal in the two industries. Consider a change in the amount of labor employed, ΔL1. Divide both sides by ΔL1. p1 = w/MPL1 = MC1 (For instance, if the marginal worker produced 2 automobiles and got paid $60,000, marginal cost of the automobile is $30,000). In competitive markets, each factor receives its marginal product. For instance, a worker's wage is the value of his marginal product. Diminishing Returns: Marginal product of labor (or any other input) declines as more is employed. 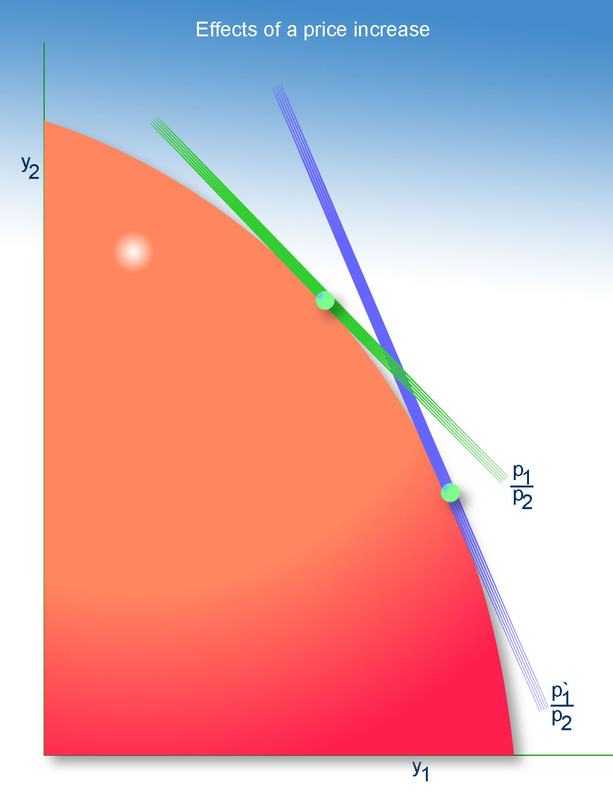 ⇒ PPF is concave to the origin! Unlike in the Ricardian model, labor is shared between the two industries. Thus, the specific factors model explains why a country produces a product and also imports it. For instance, the US produces but also imports oil from the Middle East. The exact output mix depends on the prices. If labor productivities are different in the two countries (due to differences in weather, capital or infrastructure), free trade will not equalize wage rates. However, due to diminishing marginal returns, marginal product of labor decreases with employment. In general, MPLi is not equal to MP*Li in any industry. Free trade equalizes output prices, but not wages. If labor is mobile between the two industries, one wage prevails in each country. Both industries pay the same wage in each country, but w ≠w*. How does a change in the output price affect income distribution? An increase in the price of the exportable increases wage. 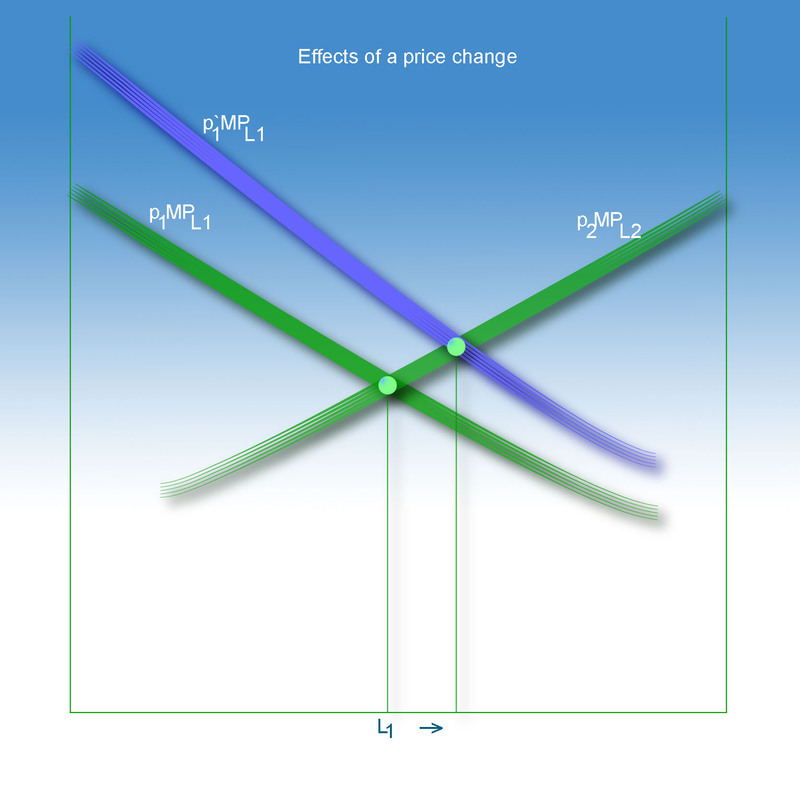 (i) An increase in the price of the exportable increases its output, i.e., the PPF is negatively sloped. (3) Which factor benefits from trade? An increase in the price of a good increases the rent of the specific factor in that industry. For instance, international trade raises the price of the exportable good (foodstuff, such as corn and soybean), which in turn raises the price of the factor stuck in that industry such as land. That is, trade raises land value in the Midwest. The world population is expected to rise to 11 billion by the end of this century. As the food price rises to keep pace with the growing population, land owners will benefit from the rising food prices. The specific factor in the export sector benefits from free trade. because a movement toward free trade (FT) increases the price of the exportable (p1). 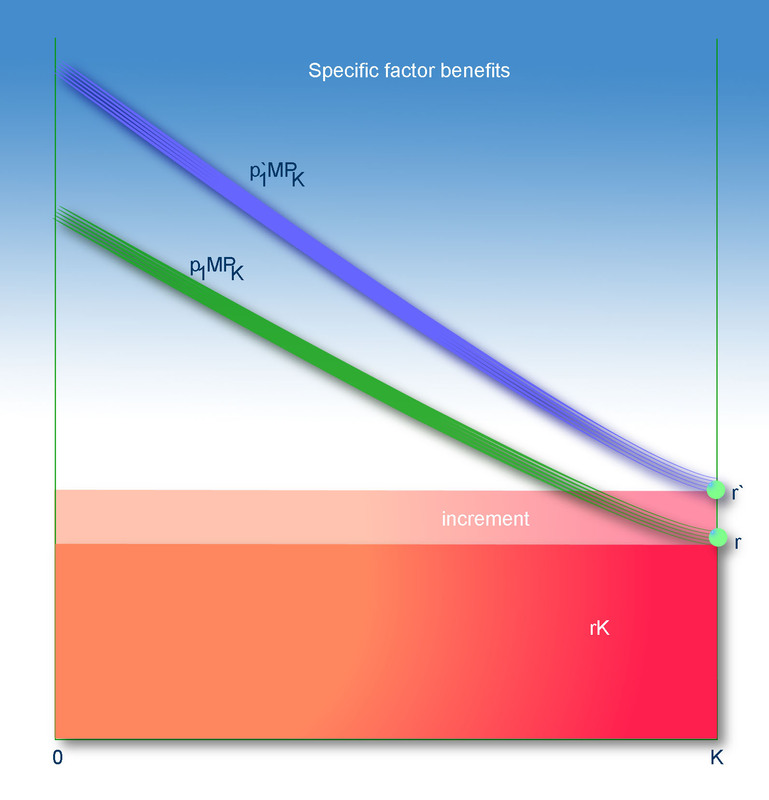 Thus, free trade increases the return to the factor (K) specific to the export sector. Example: Rising food prices raise the price of land (a necessary and specific factor in agriculture) and land owners benefit from free trade. Population growth (the world population will increase to 11 billion people) ⇒ Rising food price ⇒ rising land price during the next few decades! An increase in the price of the exportable increases its output. Note that PPF is concave to the origin, unlike that in the Ricardian model. A good example of Viner's model is the silk trade. 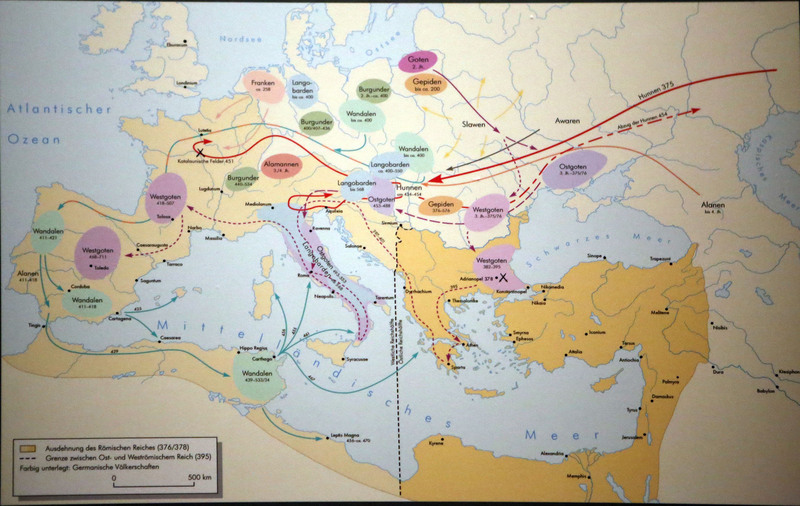 The silkroad connected China to Europe since the 1st century AD. 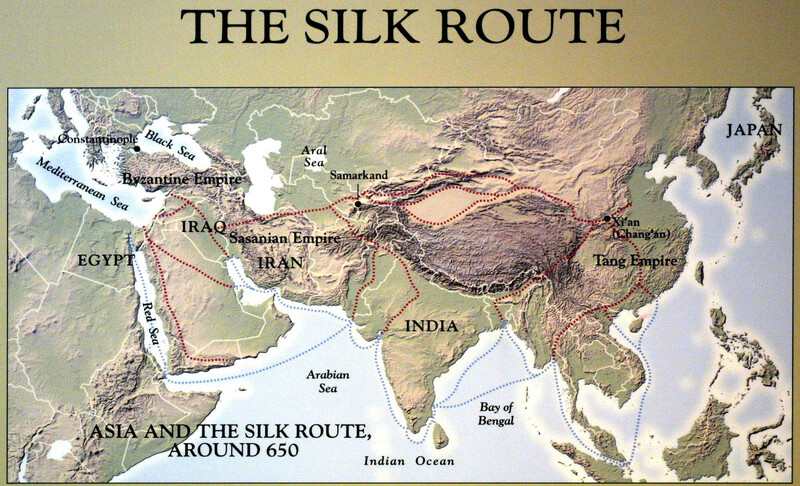 Silk was invented by the Liangzhu people who settled in Liangzhu area (near Shanghai now) about 3000 BC. China had a near monopoly of silk (The Chinese lost their secret of silk production to Korea and Japan when the Qin emperor burned books, including those made of silk, and silk workers left the country. The Chinese character chih originally meant silk, and includes the character meaning silk. (i) Emperor Justinian (527-565 AD) sent spies and obtained silkworms from China in 552 AD. Subsequently, Lucca, Genoa, and Venice became silk exporters. (ii) The Rise of Islam . In the 7th century, the Arabs blocked the overland route to China, and spread the sericulture to Spain and Sicily, while China became the silk supplier and exported high quality silk. The spread of Islam encouraged the development of Maritime Silkroad. The overland silkroad was re-established during the Tang period. Navigation: Triangular sail (Lateen sail) may have been invented by the Romans (A mosaic in Kelenderis, Turkey made in 400 AD shows a Lateen sail. ), but Lateen sails were widely used by Arabs in the Indian Ocean. (iii) The Rise of Italian city states : The Florentine silk industry was born in the last decades of the 14th century. Florence began to export large quantities of high-quality silk products to Europe. Florence accumulated so much wealth that it minted the first gold coin (Florin) in 1252 since the Roman times. Florence under the rule of the Medici family became the banking center in Europe. Economic reason for the Renaissance. Also, Venice became a shipyard in 1350s. Pisa and Genoa competed. 1 denarius = about $50 - 100. 1 sestertius = about $10 - 20 today. Rome's defense in AD 150 = 80% of the imperial budget = 2.5% of GDP. US in 2016 = 18% of the federal budget = 3.8% of GDP. As a result, Rome's military budget gradually declined. Attila the Hun had small eyes and brown skin, probably a descendant of Xiongnu, the barbarian group who lived in the northern part of China.